Australia will field a youthful line-up in their penultimate Beijing Olympic qualifying match in Hong Kong on Sunday 4 August. The Australian squad for the Hong Kong match will comprise players likely to feature in the Young Matildas team who will compete in October’s AFC U-19 Women’s Championship where a berth at the 2008 FIFA U-20 Women’s World Cup will be on the line. The Matildas face a heavy schedule in August commencing in camp on August 9 with the final Beijing Olympic qualifier against Chinese Taipei in Coffs Harbour on August 12. The team will then travel to Tianjin for matches against China on August 16 and 19 in what will be the last international matches prior to the FIFA Women’s World Cup. The team will commence their World Cup journey when they travel to China on September 5 at the conclusion of a four-day camp in Sydney.Australia will open their campaign at the World Cup against Ghana on September 12 in Hangzhou. Opinion: So the Aussie footballers want to help? I'm talking about money, right. I'd loved to see the game grow in Australia. A strong domestic league would be fantastic. Anything I can do to help. Can't wait to come back and play in Australia. All my family are there and I'd love to come home. Now I'm sure you've heard some of these comments from Australian players overseas during the course of the last three years. I know I have. But it's time to get real. No Australian player will come back to assist the game. As Kevin Keegan once said, "Football is just about money, a business." Maybe not to me or you. Only we fans appreciate the game for what it is. A game. For those that work in it, it's a job, a lifestyle, a business or a career. John Aloisi 31, may be going to Swansea City. Swansea City! Who has heard of them. English Division what? Oh maybe he'll go for the scenery. The docks are beautiful compared to Sydney Harbour. Sydney FC's manager Branko Culina said, "John wanted more than Robbie Fowler and a three yea contract." So when will Aloisi come back? When he's 33 and lost his pace. No thanks John. Craig Moore. He's back playing with Queensland Roar. For the good of Australian football? Give me a break. He hardly played for Newcastle United in the last two years. His contract was up and at 31 his injuries would scare anyone bar an Australian club. Oh and he's just finished his house in Queensland in late July. Guess no-one wanted him in Europe; either that or he was just going to miss pre-season. It's great to have Craig Moore back, but don't tell me he's doing it for Australian football. And Sydney FC's Tony Popovic is back. Fantastic. But why not twelve months ago. Because as everyone knows Qatar offers more dosh. So has anyone come back for the good of the Australia game. Nick Rizzo at Perth Glory. Don't think so. On loan to Chesterfield or back at Perth with a possible Socceroos call-up. Nick's back for Nick. Archie Thompson. Couldn't wait to get to PSV pre-World Cup. Three minutes in six months for PSV meant Archie's back. And I love Archie too. And maybe just maybe only Kevin Muscat is back for Australian football. He was young enough to stay in Europe. Fit enough to stay. Sure his price is right here but he could probably have matched it overseas. Now it's not sour grapes. Let players go where they wish I say. Careers are short and earning capacity for many is limited to ten years. Just don't tell me they are coming back for the good of the Australian game. Prove me wrong or add to the fire. The Belwest Foxes have regained the league lead from Weston Creek in round eleven of the Club Pink Women’s Premier League over the weekend. Belwest held the lead for the first six rounds this year but surrendered the top spot to Weston Creek who has hung on to it until the weekend. Belwest reclaimed the lead with a 4-1 defeat of ANU WFC at Kaleen. Four individual goal scorers helped see Belwest move up the ladder, goals from Nicole Monks, Karen Clarke, Cian Maciejewski and Leanne Mills sealing the victory. ANU’s Amy Kilpatrick got one back for the home side. With the loss to ANU a nearly insurmountable gap has formed between the bottom two clubs and the top four with an eight point gap separating the two. At the top of the table, the Foxes have a two point lead ahead of Weston Creek. The result sets up a huge match against third placed Canberra City – Limestone Academy. Canberra City – LA provided the upset of the round as they defeated Weston Creek 2-nil, knocking them off the top of the table in the process. The three points were important for both teams as City were hoping to remain in the top three while Weston Creek were looking remain the leaders. In the final match of the round, Belconnen United got up 3-nil against cellar-dwellers Woden Valley. United needed the victory to remain in touch with the top three with only four rounds to go. A brace from Belconnen’s Nicole Somi and another from Matina Gazis ensuring the north side club returned home with the valued points. It’s Woden Valley’s sixth straight loss and fourth consecutive without having scored a single goal. Somi’s two goals moving her two steps closer to the league’s leading goal scorer Luisa Marzotto as the season draws to a close. The result leaves Woden Valley and ANU WFC to battle it out for the wooden spoon. Ilahna Aitchison scored herself at the correct end. Canberra City – LA is the Club Pink Women’s Premier League in-form team at the moment having gone having not lost since the long weekend at the beginning of June. City is now only three points behind Belwest and one point behind second placed Weston Creek. In the final match of the round, Belconnen United got up 3-nil against cellar-dwellers Woden Valley. United needed the victory to remain in touch with the top three with only four rounds to go. A brace from Belconnen’s Nicole Somi and another from Matina Gazis ensuring the north side club returned home with the valued points. It’s Woden Valley’s sixth straight loss and fourth consecutive without having scored a single goal. Somi’s two goals moving her two steps closer to the league’s leading goal scorer Luisa Marzotto as the season draws to a close. And so the journey for the ACT boys begins. These lads could be on the start of a very long journey. Not just at this tournament. Who knows where we may be reading their names in future years. Australia’s latest crop of Qantas Joeys will take their first steps in an international environment next week when an 18-strong squad will depart Australia to compete in the Toyota International Youth Football Championship in Japan. The Qantas Joeys will commence the long-road towards qualification for the 2009 FIFA U-17 World Cup with participation in the prestigious annual six-nation tournament. Australia will meet Japan and the USA in their group matches before play-off matches will decide the tournament placings with the Korean Republic, United Arab Emirates and a Japanese High Schools team in the other group. The Qantas Joeys will spend three days in camp in Sydney before departing for Japan on Sunday. In keeping with the age bracket for the 2009 World Cup, coach Martyn Crook will take an underage squad to the U-16 tournament in Japan consisting primarily of players in the U-15 category supplemented by three players in the U-16 age group. “This tournament will be a great experience for such young players and will provide an ideal test for them both as individuals and as a group ahead of the start of qualifying in October,” said Crook. Australia will travel to Singapore in October for the first stage of qualifying with two of six teams to progress to next year’s AFC U-16 Championship. PM, Craig Foster in agreement. Prime Minister John Howard, who has cancelled plans to fly to the Homeless World Cup final in Copenhagen, claimed,"It's clearly unfair. 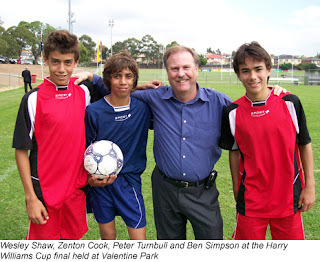 With my Government powering along under Treasurer Peter Costello's econmic management, taking part in the Homeless World Cup, really, it makes a laughing stock of everything we have achieved in office." Australia were beaten heavily in their opening match of the fifth Homeless World Cup, by Scotland. Oh well at least Scotland finally get to play in a World Cup, and then lo and behold they win a game. Expect the Tartan Hordes to cross the North Sea as the team progresses. Scotland, who hosted the tournament two years ago in Edinburgh, beat Australia 13-0 in their opening match.All the games are taking place in a specially-constructed stadium in Copenhagen's city square. "We lucky to field a homeless side at all, under the current Government, never mind a good one." said Liberal Health Minister Tony Abbott. Craig Foster, SBS Analyst, said, "There needs to be a wipeout. Technically the houses are just built to last. Get away from the English style of building, back to a more temporary building, watch those houses collapse from an early age. Then you'll see a future Australian team with a wide pool of technically homeless kids like say the Brazilians or Africans. Then we can compete at this level." Is this the way forward for Australia. Let us know what you think. Canberra's Indigenous Australian keeper Lydia Williams has been given the all clear to play in the up coming World Cup in China. Lydia, had her wrist in a cast recently, and missed the Olympic qualifiers against North Korea. "I'm fine now, " said Lydia today. "I had the cast off two weeks ago and now I just have to wait to see if I'm in the squad." With thirty players called into the recent camp at Coffs Harbour, Lydia like the other three keepers will have a nervous wait overnight. Coach Tom Sermanni is expected to announce the squad of 23 tomorrow. Lydia had just returned from work when I spoke to her today. Just six weeks out from the World Cup the thought crossed my mind how different life was for out female stars. 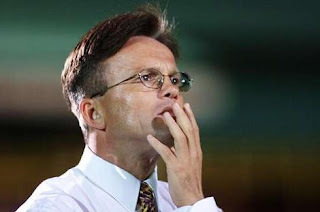 Can you imagine Mark Scharzwer having to do a job while waiting to see if he was in the World Cup squad! Still good luck to Lydia and all the players from the ACT. Amy Chapman, Caitlin Munoz and of course Sally Shipard who writes each week for this blog will all be aiming to get the phone call tomorrow from Sermanni to say, "Yes you're in you're off to the World Cup." Talking to the walking wounded! Sydney FC Steve Corica and Iain Fyfe. Football in the Capital caught up with some of the injured stars from yesterday's games. Friendly, and obliging all had something to say. Iain Fyfe, Sydney FC, currently out with shin splints but expects to be back this week. Although he did say you could never be sure with this type of injury. Iain, how did you enjoy living in Hamilton when you played in Scotland. I'm a Celtic fan so travelled past that dire town many times? "I lived there with Dave (Carney) and we just said, we've got to get out of here. The Australian league was in limbo, I'd gone overseas to see relatives and a cousin asked me to try out. I ended up at Hamilton in Scottish Division 1. It wasn't pretty. Get to play at Celtic Park? Well I had to ask! "No, I did get to play at some Premier League grounds, but not Celtic. The football wasn't of a very high standard in Div 1. Dave and I were glad to get away." Dean Heffernan, Central Coast Mariners. Dean what were the key differences between your time in Germany and that as a footballer in Australia? "Off the field, football in Germany is 24/7. There really was no way of getting away from the game. I found that hard. 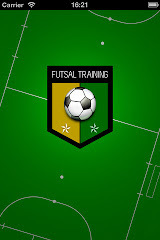 "On the field, the training was different. In Germany we trained three times a day with a ball. Morning, afternoon and finished with a game. We never went in the gym pre-season. With the Mariners we have two sessions, one of which is in the gym, which helps with conditioning." "For me having a ball at my feet so often, helps improve your technique, and hopefully that has improved my game." "It's great to be back and I'm hoping to get a few goals again this season." Did you miss out on the left-back position for the Socceroos by going overseas? David Carney obviously gained by you not being around. "No regrets obviously. It was great for experience, playing on a different level with World Class players in training." "Next Socceroos left-back." interjects Mariners Deputy Chairman Peter Turnbull. "That's the plan, " says Heffernan. "With more Asian Cup and World Cup qualifiers hopefully there will be more opportunities." Wouldn't rule it out, would you? With numerous goals from left back in his first season with the Mariners and a terrific engine, crucial in International football, our Socceroos left side of defence may not be such a problem in the coming years after all. Interestingly the Mariners did look way more physical than Sydney FC yesterday. Maybe player/physio Andrew Clark's techniques is producing significant results. Jacob missed all, of last season, bar two games. After playing the first season how frustrating was it. "Very frustrating, especially when we were struggling a little at times. I was a young guy in the first season and just learning. I enjoyed playing with Dwight Yorke and under Pierre Littbarski. It was all new for me and I was just getting going. I'm injured again but I should be back for the first game. Have you been surprised at the success of the A-League? "No, not really. People outside of football might be, but it's always had potential in the country, and probably just needed a boost." Will it be difficult to get back in the team? Sydney has a few new defenders including Tony Popovic, is this a problem? "I can learn a lot from Poppa so I am looking forward to working with him. He's a real leader. I'm looking forward to winning a place in the team and trying to improve this season." Why aren't you playing Steve? "Bit of a bad back." Which lead me nicely to ask what Steve was going to do after football. "Well, Sydney FC have started an Academy. I'm involved in Coaching there." So you'll stay in football after you finish playing? "Yes I'd like to for sure." Best game you played in overseas? "Probably for Wolves against Barcelona or Liverpool." Best goal you ever scored? "That would have to be for Sydney in the Grand Final." All players were particularly welcoming and supportive. It was a very positive experience for me. Thanks guys. A great day out for the people of Canberra. 5,700 through the gate on top of the 7,000 plus last season show once again the potential for an A-League team in Canberra. Canberra Cosmos dreamed of such crowds. Central Coast produced a strong performance across the park. With Sasho Petrovski, and Nick Mrdja pushing last seasons top scorer Adam Kwasnik to the wings, the quality of the forward line looks strong. In fact I'd put $10 on Kwasnik to finish top scorer for the whole league. He gets heaps of chances, is tremendously fit and strong, takes the penalties and may relax in front of goal with other recognised strikers alongside. Indeed he scored a neat second goal for the Mariners even if he was offside. The Mariners look fit. As always. Quality across the park and with Dean Heffernan, Paul O'Grady and Tom Pondeljak all on the bench or unfit Mariners fans should be delighted with the prospects for the season. Dean Heffernan sitting relaxed in the cool Canberra winters day said, "Training three times a day with a ball in Germany was a big contrast from two sessions a day, with one of those at the gym, with the Mariners." Still a different training style but Mariners fans will be confident of a good start. Cracking goals from Matthew Osman and Adam Kwasnik before half-time, were outdone by the games best, a twenty yard dipping volley from Andre Gumprecht. Mariners Media man Ben Coonan was quietly happy with his afternoon, although trying to remember it's only pre-season and the Mariners as Ben pointed out always do well in pre-season. Sure Sydney had players missing. Are Mark Milligan and Davd Carney missing? Or are they gone? Sydney's season could be a long struggle if these guys go. But with Steve Corica, Jacob Timpano Iain Fyfe, and Ruben Zadkovich out injured then perhaps the best Sydney could say is that they can only get better. Branko Culina looked angry after the performance, saying his midfield was outplayed all afternoon. Lawrie McKinna said the Canberra Stadium was great for football and a pity the stadium wasn't used more! Interestingly Canberra and Sydney FC's Adam Casey has been used as full back on a couple of occasions now by Culina. Alex Brosque and David Zdrillic provided little spark up front. With the players Sydney have to come back their defence and midfield should be strong. Goals scoring I imagine will remain a problem. Makes you wonder why Sasho Petrovski was released really. Still a long way to go. First blood to the Mariners and looking forward already to the A-League's first game of the season between Sydney FC and Central Coast Mariners. A good news story if ever I heard one! Talking to Central Coast Mariners Deputy Chairman Peter Turnbull this afternoon at the Sydney FC Central Coast Pre-Season A-League game was inspirational. Peter is clearly a football man from way back, having played the game, watched and administrated at many levels. And he is still playing at the age of 51. He has a game tomorrow night. Peter talked about the present structure of the Mariners, the player base, the Academy side, the Central Coast Lightning and the Mariners. A clear structure for the region's players, and it was partly this that attracted him to invest in the club. He also talked about the successful sponsorship the Mariners have attracted. The best in the A-League he thought. He told me how despite some solutions still required, the game was going to go continue to develop across Australia. But what really inspired me was when he talked about how he provided scholarships for three Indigenous children to play football. The kit, the balls the whole shebang and access to the Johnny Warren Football Foundation. And when he talked about the Indigenous teams playing in the Harry Williams cup recently he talked about the attacking nature of these children. AFL and Rugby League have used Indigenous Australians to great effect. But as Peter pointed out, some of the Indigenous boys natural skill and agility lend themselves more easily to football. Enjoyed the chat Peter, long may your passion for the game endure. He also said this blog had too Sydney FC on it! For the record: Mariners 3 Sydney FC 0. Branko, "I expect us to have a marquee player." Football in the Capital caught up with Sydney FC Coach Branko Culina before thepre-season game with the Central Coast Mariners. 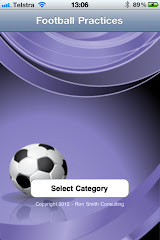 Given the club’s excellent performance in the Asia Champions League what are your expectations for the coming year. “Well, it’s fair to say we expect to continue on in the same way. Sydney FC want to be on top, and for the game to continue to grow in Australia we need a strong Sydney FC and Melbourne Victory. The Central Coast seems to have engaged with their community far better than Sydney FC, and they are reaping the rewards in terms of sponsorship, any thoughts?" Sydney fans are concerned over player numbers and quality, particularly if Socceroos Mark Milligan and David Carney leave. “Sometimes you have to spend more on new, better players to grow the game. And it costs money." But could Sydney FC afford to pay? Will Sydney FC get a marquee signing? John Aloisi, or another striker? Branko laughs, “Everyone tells me I need a striker, but an attacking midfielder may also be valuable. Well, Aloisi wanted a three year contract and more money than Robbie Fowler or Phillip Cocu!" You claim Sydney were underdone against Wellington Phoenix when you lost 3-0. Why is this? 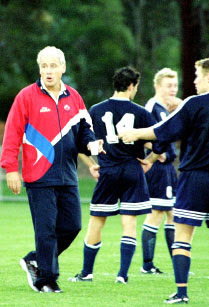 And fond memories of Canberra from your time as Canberra Cosmos Coach? Australian referee Mark Shield will add another prestigious honour to his lengthy tally of international appointments after it was announced that 33-year-old will control tomorrow’s AFC Asian Cup Final between Iraq and Saudi Arabia in Jakarta. The Brisbane-based Shield has already refereed four previous matches in the tournament - Korea Republic vs Saudi Arabia, Saudi Arabia vs Indonesia, Indonesia vs Korea Republic (all group stage matches) and Iran vs Korea Republic (quarterfinal). Great to see one Aussie in the Asian Cup Final. Well done Mark Shield. The Qantas Young Socceroos kicked off the Weifang Cup with an encouraging 1-0 win over the Korean Republic (South Korea) overnight in stifling conditions in Weifang, China. Adelaide United’s recent signing Matthew Mullen scored the winner in the 73rd minute with a low first time strike from inside the penalty area following a corner from James Holland. The first notable chance of the match did not arrive until just after the half time break when Queensland Roar striker Tahj Minniecon struck his shot just over the crossbar. Australia grew in confidence as the match wore on and started to dominate the Koreans who seemed to struggled in the challenging conditions. The Australians thought they had taken the lead in the 52nd minute after a scramble following a corner but the goal was ruled out for a foul on the keeper. Korea’s keeper made a great save to deny Australia in the 72nd minute however Mullen ensured the win from the resulting corner. The match was first international outing for the current generation of Young Socceroos and there will be further matches over the coming week against host-nation China, Iran, Uzbekistan and top Chinese club Shandong Luneng. The long road towards the 2009 FIFA World Youth Cup will commence in October with the first stage of qualifying to be followed next year by the AFC U-19 Championship. Good to see Canberran Kaz Patafta set to partner Allsopp in attack tonight. Former Young Socceroo Captain Kaz Patafta is likely to fill the boots of Archie Thompson as Melbourne Victory takes on Perth Glory in Round 3 of the Pre-Season Cup in Darwin. Victory report, "Following a grueling trip back from Asian Cup duty with the Qantas Socceroos, Thompson has been ruled out of the clash, leaving the door open for Patafta to make his mark in the forward line along side Danny Allsopp." Wonder how hard the trip back was for Archie? A flight from Hanoi to Melbourne. Yep sounds really gruelling, probably in Economy class alongside people like me! More importantly Patafta has had some excellent game time for Victory since his return but with The Gruelled (is that a word)Archie, Brazilian Love (that is his name)and Hernandez all pushing for game time, competition for places is heating up ahead of the A-League opener against Wellington. Branko Culina says, "The A-League needs a successful Sydney FC." Talking to our local A-League Club Coach today. Well it's true, if sad. But that may well soon change if my earlier post today comes to fruition. Banko Culina says, "I expect Sydney will get a marquee player this week." Branko laughed as the Sydney FC coach cruised into Canberra. "Everyone thinks we should sign a forward. An attacking midfielder might be a better option. Also money influences what you can get." Branko talks Sydney FC, player signings, John Aloisi, FFA hindering the club, Olyroos and his views on the coming season. Full interview Monday after the Central Coast game which is being played in Canberra on Sunday. The Canberra A-League bid is up and running. Rejoice! Talking to various people around town today it seems there has been excellent progress made with the bid. This bid will bring the community and business groups together with the aim of not just getting a team into the A-League, oh no this bid wants more. This Canberra team would aim to win the A-League, take on Asia's best in the Asian Champions League and who knows one day aim to play in the Fifa World Cup Championship. A Canberra football team playing across Asia. Now you're talking. So the bid sounds secretive. Well yes it is. Out of respect for those involved in the bid I have kept the report general. At this stage there is a bid coming and things are progressing very well. When details are further advanced, which should not be long, more information will be released. So football fans of Canberra rejoice and you can show your support here by adding a comment of support. Would you like to see an A-League team in Canberra? I'm in Canberra at the moment. It's pretty hectic as I'm only here until Sunday. It's been awesome weather for the last two days so no complaints. Certainly cooler than Bangkok and Hanoi! side some of the players I've looked up to. Of course, it was tough sitting on the sidelines and not playing, I was frustrated at the time but looking back I know I worked as hard as I could to push for a place in the side, so no regrets. It's made me even hungrier to get a starting jersey in the Socceroos. It was good to see Mark Milligan play an awesome Asian Cup, and Michael Beauchamp was also great although few probably realised he played with a pretty sore ankle. At the moment I'm having a short rest in Canberra. everyone needs a rest after a major tournament. Valeri and Adam Morgan, for years. to get back into playing in the Serie B. This will be new to the city and me. walking straight into the starting eleven because we have a new coach. Whenever a team has a new coach it is always hard work to get in the team. But I love a challenge so I'm looking forward to it. Eamonn: Carl will talk to us from Grosseto, Tuscany next week as he prepares for the start of the Serie B season. Not that this tournament at the AIS was about winning, have you ever known a group of players playing to lose, and didn't the lads from the ACTAS do well. A number of the local players have put their best feet forward for national selection with the skill shown in front of the Qantas Joeys coach Martyn Crook and assistant coach Jean-Paul de Marigny. “I’ll be very disappointed if we don’t have a number of players selected for national squads. It would be very difficult to argue against their inclusion considering we beat everyone we’ve played and the way we’ve played, it would definitely be disappointing if they’re not selected,” ACTAS football coach Mike Milovanovic. It’s unknown when the Joey’s squad will be selected. Here's the results of the ACT lads. Four ACT players have been selected in the National Under – 17’s squad to tour Japan early next month after their stand out performance at the NTC Institute Challenge this week. Chris Bush, Danai Gapare and Stephen Domenici have all been named in the squad with Ben Harrington named as a stand-by for that team. “Having three to four players from the ACT in a 16 to 18 man squad is tremendous. To think that 20%-25% of the national team is from Canberra is a bonus for everyone here. Big pat on the back to Mike Milovanovic for what he’s doing at ACTAS and the level of our program,” Capital Football technical director Ian Shaw said. All four players are members of the ACTAS program who won all five of their matches against their interstate opposition. Remaining the only undefeated state/territory come the conclusion of the competition - only conceding a single goal throughout the six day event at the AIS. “NTC was a fantastic event for all these players to gauge where they’re at in their own personal development,” Shaw said. This is the latest honour for the combined ACTAS and Capital Football partnership further reinforcing the strength of Canberra’s junior development and elite player pathway. Already there’s four Canberrans currently training with the Matilda’s and two former players are now members of the AIS men’s football program. Best AIS players haven't done as well as expected..yet! Perth Glory's David Tarka a player on the rise? Speaking to Steve O'Connor recently who has spent 17 years at the AIS as Assistant and now as Head Coach. We discussed all things AIS, see earlier post under Steve O'Connor label. "Steve who was the player you thought most likely to succeed at the top level, or who you thought would kick on to play Serie A or EPl but hasn't." O'Connor replied, "You get a lot of quality through here, but so many things can interfere in a players development. Injuries and just bad luck etc. The two players who I thought would have gone higher, David Tarka now at Perth Glory. He's only really getting going again after injuries. So he may well go to a higher level and Wayne (John ) Srhoj, now playing in Romania I think." Sally Shipard on the effects of an eleven month break. Sally Shipard writes every week for Football in the Capital. Sally keeps us updated on all Matildas news. This weeks Sally discusses the recent training camps in Coffs Harbour and plans pre-World Cup. Over the past 2 weeks the Matildas were up in Coffs Harbour. Fabulous weather and a great training environment helped calm the nerves considering it was our final selection camp for the World Cup. We had 2 internationals against New Zealand, winning both games 3-0 and 1-0. The Squad which Tommy (Sermanni) had arranged to attend the camp was big enough to field 2 completely different sides for the matches. Everyone performed well and I'm sure the selection process for Tommy and the rest of the coaching staff is not getting any easier. One of the things that I have realised is that when you return from a long-term injury it takes a while to feel like your 'old-self'. My fitness has returned, but my game sense and decisions on the ball hasn't. I'm panicking on the ball in places where I shouldn't or wouldn't have before my 11 month break from Senior Womens Football. Game time is definitely going to speed up the process. We have a trip to China mid-August for some internationals which will be our last hit out before we begin our World Cup finals campaign. It will provide the squad with some competitive, high intensity games against the Chinese National team. We will return back in Australia with one week till we go back again for the World Cup. Because of the China trip, Tommy has been forced to select the squad 2 weeks earlier than he had first planned. The team is announced next Tuesday. A long and anxious wait for all of us. Eamonn: The squad will be listed here as soon as it is released. Football or cricket? Which would you choose? Spare a thought for talented young Australian sportswoman Elyse Perry. She has just represented Australia in cricket against New Zealand. The youngest Australian cricketer to represent thenational side. Then she flies off to China with the young Matildas. As Asian Cups and World Cups are around the corner, it may soon be decision time for Perry. Elyse's choice and no doubt various repesentatives will be putting pressure on her. So you want to see an A-League team in Canberra, well it's time to get out and support Sunday's game. Sydney FC v Central Coast Mariners comes to Canberra Stadium on Sunday. Under 12's are free, and tickets can be bought at the gate. Central Coast have a strong team. Expect them to do well this year, with Dean Heffernan, Sasho Petrovski and fit again Nick Mrdja and John Hutchison. All these players can score goals and this was the Mariners biggest problem last year. From a Canberra point of view the Mariners are a model on which a future Canberra A-League bid should be based. Community community and community is the focus. Unlike Sydney FC who have set themselves up as the glamour club. And with little significant signings this year, unless you count an ageing Tony Popovic as a crowd puller, it seems the club are struggling to excite the local public. The A-League needs a strong Sydney, Lets hope Branko Culina can continue the style of play used in the Asian Champions League. With player numbers low and recruitment slow, to say the least, I expect a stop-go sort of season from Sydney. Still things can change but after being thumped 3-0 last week by Wellington, Culina will be keen to get their first win of the pre-season. Football in Asia just never stops! Australia’s next generation of stars will play their first international matches later this week when the Qantas Young Socceroos compete in the 2007 Weifang Cup in China against some of Asia’s heavyweights. The six-team tournament will see Australia pitted against host-nation China, Iran, South Korea, Uzbekistan and top Chinese club Shandong Luneng during the eight-day tournament which commences on Friday. “The experience the players will gain will be invaluable in regards the playing conditions and also in facing a variety of opponents,” said Qantas Young Socceroos Coach Steve O’Connor. The 20-strong squad features mainly players based at the Australian Institute of Sports though three are currently contracted to Hyundai A-League clubs in Central Coast Mariners goalkeeper Andrew Redmayne, Adelaide United midfielder Matthew Mullen and Queensland Roar striker Tahj Minniecon. Striker and Newcastle Jets trainee Jason Hoffman is also included in the squad. Who did the most to get Australia to the World Cup? Guus Hiddink, Frank Lowy or John O'Neill? What about Steve O'Connor from the Australian Institute of Sport. Without the preparation of the players from a young age we may never have had the quality to turn Lowy and O Neill's administration skills into Hiddinks final product. Football in the Capital caught up with Steve O'Connor recently at the AIS, some sixteen years after he first put a young Mark Viduka through his paces. Who was the most instrumental person in getting Australia to last year’s World Cup in Germany? Frank Lowy, John O’Neill or Guus Hiddink? Many would put forward one of these names. Here’s another name. Steve O’Connor. Steve O’Connor. Or Rocky as he is affectionately known. Steve has been Coach at the Australian Institute Sport since 1991, apart from when he went to the NSWIS to coach the likes of Harry Kewell for a year. Mark Viduka, Craig Moore, Brett Emerton, Vince Grella, Luke Wiltshire, Marco Bresciano, Mile Sterjovski, Josip Skoko and Mark Milligan are just some of squad of 2006 who O’Connor has guided along their football journey. When O’Connor talks about the players, the young men he has taught, his eyes smile. Viduka and Moore were at the AIS in 1992. They both played in an AIS team which won the local ACT Premier League. And so it proved. Not only had O’Connor’s dreams and goals for his students come through. The squad went one better than the 1974 side which was the only previous Australian team to qualify. This side went to the next round, before losing to Italy by a disputed Francesco Totti penalty. The standards have been set. How are players chosen to come to the AIS? Australian’s football move to Asia has put more pressure on O’Connor and his young men. At the indoor centre a few of the next generation are hitting balls towards the goal, from thirty metres out. They are supposed to be aiming for a corner, left or right. Some are missing. Canberra’s Dom Giampaolo is among the group. Another class. Maybe another Kewell or Viduka right there. After all these years, for O’Connor the challenge remains. To produce young men to fulfil their potential, and match the best in the biggest game of all. It wasn't meant to be for Carl Valeri. He'll fly to Tuscany now and join up with his team mates as Grosseto head into Serie B for the first time ever. It's all over. Carl Valeri was the Socceroo who very nearly got to play. He was told to warm up against Thailand. Then get ready and Coach Graham Arnold was just to about to put his number up and send him on. Carl Valeri's media fan club were on the edge of our seats. There were two of us, very keen to see the Canberran make his mark. Then Tim Cahill crosses and Mark Viduka scores. At 2-0 everyone relaxed and Carl was sent back to the bench. With Vince Grella sent off against Japan, Carl may well have stepped in as his replacement if Australia had gone through. Sometimes you are just not meant to play! It will be great to see Canberrans Sally Shipard, Caitlin Munoz, Lydia Williams and hopefully Amy Chapman live on SBS during their World Cup campaign. In 2007 it is the women’s turn to compete on the world football stage for the title of World Champions and in September SBS will broadcast the 5th FIFA Women’s World Cup LIVE from China. After placing second to China PR in the 2006 AFC Women's Asian Cup, the Matildas secured themselves a place in the 2007 tournament and Australia’s fourth showing at the FIFA Women’s World Cup. After a missing out on qualification for the 2008 Beijing Olympics, the Matildas will be looking to rise from the ashes in true Australian spirit and prove they are a force in international women’s football. Australian audiences will be able to watch ALL Matilda’s matches on free-to-air television with SBS broadcasting the group matches against Ghana, Norway and Canada plus the semi finals and final, LIVE. SBS will broadcast the Matilda’s first match of the tournament against Ghana on Wednesday 12 September LIVE in prime-time at 7:00pm AEST. Three nights later the Australian’s will battle Norway from 10:00pm on Saturday 15th as well as their final contest of the group round against Canada on Wednesday 19th, kick off at 10:00pm. SBS Host, Andrew Orsatti and Chief Football Analyst, Craig Foster will present the FIFA Women’s World Cup with Les Murray hosting the tournament’s highlights as the Football Feature each Sunday during the competition (16, 23 and 30 September) from 4:00-5:00pm. The Australia v Japan AFC Asian Cup football match on Saturday night created a new Australian Subscription TV record audience with an average of 419,000 people watching the game on FOX SPORTS. The Australia v Japan AFC Asian Cup quarter final had a higher average audience than any program in the history of Australian Subscription TV as well as a peak audience of 515,000 during the penalty shoot out. The match, which went right down to the wire before Australia was knocked out in heart-breaking circumstances, also attracted a total audience of 1,029,000, according to ratings recorded by OzTAM Data. These figures do not include the huge number of people who watched the match at one of 3,600 FOX SPORTS venues around Australia in what was a massive night of sport on Saturday night. Capital Football's Chris Gottas sent in this report on the NTC Institute Challenge. The partnership between the Capital Football Academy and the ACT Academy of Sport is proving to be a success at the ACTAS NTC Institute Challenge with the local side recording three wins from as many games as we reach the half way stage of the national tournament. The future of Australian football has converged on the nation’s capital in the form of eight State Institute squads all of whom are being watched by the Qantas Joeys coach Martyn Crook and assistant coach Jean-Paul de Marigny. The ACTAS have been the ones to watch with a 2-1 victory over the West Australian Institute of Sport on the opening day followed by a 2-nil defeat of South Australia and a 5-nil demolition of the Queensland Academy of Sport. The participating teams are ACT Academy of Sport (ACTAS), New South Wales Institute of Sport (NSWIS), Northern New South Wales Institute of Sport (Newcastle based - NNSWIS), Queensland Academy of Sport (QAS), South Australian Institute of Sport (SASI), Tasmanian Institute of Sport (TIS), Victorian Institute of Sport (VIS) and the Western Australian Institute of Sport (WAIS). Already the Academy/ACTAS program has established itself to be a breeding ground with four current members up for possible Joey selection also four members are currently training with the Matilda’s and two former players are now members of the AIS men’s football program. Tomorrow the ACTAS will host the Victorian Institute of Sport before taking on the Tasmanian Institute of Sport on Wednesday. Who would you build your World Cup team around after seeing the Asia Cup. Harry, Nathan Burns on the bench, assuming Mark Viduka retired. Who else have we got?? Build for the future. Two steps back to take one forward. For me the key problem is the class in the forward line or lack of it. Scott McDonald Celtic and Josh Kennedy FC Nurnberg are probably the way forward. Mark Viduka can help from the bench in some games. John Aloisi can go now. Archie Thompson can assist, but Nathan Burns, Mark Bridge and Bruce Djite, Brett Holman have to be nurtured and given their opportunities. Viduka and Aloisi cannot take us to the World Cup, and their lack of pace stifles how the team can play. And we need to build for Asia Cup 2011 and World Cup 2014. We may not make 2010 and therefore a longer term strategy needs to be in place. Do we have one? Who would you build your World Cup qualifying team around? The Matildas defeated New Zealand 1-0 in a practice match played in Coffs Harbour today to complete a clean sweep of the two-match series as both teams continue preparations for September’s FIFA Women’s World Cup in China. The only goal of the match came after 24 minutes when speedy striker Lisa DeVanna outpaced the defence following a long-ball from goalkeeper Melissa Barbieri.Australian coach Tom Sermanni fielded an experimental line-up with the World Cup squad to be selected next month. None of the starting players from Thursday’s 3-0 win featured in the match and there were three Australian debutants in Melbourne-based defender Louisa Bisbi, Brisbane defender Ellen Beaumont and ACT midfielder Amy Chapman. Barbieri was rarely tested in the Australian goal with Australia coming closest to scoring in the second half when Kate Gill outpaced the defence but her lofted shot over the advancing goalkeeper narrowly cleared the crossbar. The Matildas will return to Coffs Harbour next month when they wrap up their Olympic qualification match schedule against Chinese Taipei on Sunday 12 following the penultimate group match in Hong Kong on Sunday 4 August.The 2007 FIFA Women’s World Cup will feature 16 nations and will be held in the cities of Chengdu, Hangzhou, Shanghai, Tianjin and Wuhan, September 10-30. Australia will open their campaign at the 2007 FIFA Women’s World Cup against Ghana on September 12 in Hangzhou. The Matildas will then meet world number four ranked team Norway on September 15 in the same city, before the final group match against Canada on September 19 in Chengdu. Aussie fans snuggle down under the doona to watch the Socceroos take on Japan in the Asian Cup. "Why didn't Scharzwer move for that penalty mum?" "I'm not happy because we lost." Just a few comments drifting across from the experts during the game. Foxtel, bringing the community together! Football is the number one sport in Canberra. "soccer is Canberra's number one participation sport. 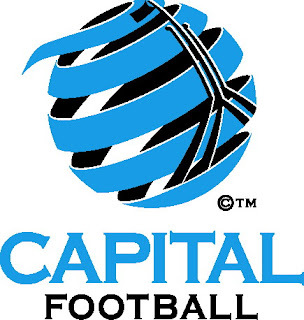 Capital Football's participation numbers have increased at a rate of 13 percent over the past two years and in 2007 there are more than 16,000 registered players in men's, women's, junior and futsal leagues in Canberra. It almost triples the number of juniors in rugby league and union with more than 11,000 in 2007 and it has the largest number of women in any football code in Canberra." Which is why we need an A-League team. It may take three years, or even five. But we are going to do it and do it right. We need to turn this interest and knowledge in the game, into support for the best team in Australia. Now we need a name. Any ideas? Australia’s finest young talent will compete in Canberra over the next six days with eight State Institute squads competing in the ACT Academy of Sport Institute Challenge under the watchful eye of Qantas Joeys coach Martyn Crook and assistant coach Jean-Paul de Marigny. The Academy squads primarily consist of players born in 1990 and 1991 with the later players eligible for the Qantas Joeys who will commence their long road towards the 2009 FIFA U-17 World Cup next month when the squad competes in the Toyota International Youth Tournament in Japan. The Qantas Joeys will commence their qualifying campaign for the FIFA U-17 World Cup in October where six nations will compete for two available berths at next year’s AFC U-16 Championship. Australia defeated New Zealand 3-0 today in a practice match played in Coffs Harbour as the team continues preparations for September’s FIFA Women’s World Cup in China. Australia dominated length periods of the match but were unable to break down their trans-Tasman rivals in a scoreless first half at the Novotel Pacific Bay training ground. Prolific Australian striker Sarah Walsh broke the deadlock soon after the interval scoring a brace of goals within a thirteen minute period. Walsh’s first was a solid angled shot from the right, with the second a close range header after attacking fullback Heather Garriock had fired a fierce long-range shot onto the underside of the crossbar. Substitute Lana Harch concluded the scoring eight minutes from time with a left footed strike from inside the penalty area that deflected off a New Zealand defender en-route to goal. “I am largely pleased with the match and we had some good passages of play in a game that was an excellent hit-out against international opposition as we continue our preparations for September,” said Australian coach Tom Sermanni. Australia will meet New Zealand in a second match on Sunday 22 July (1pm) at the Novotel Pacific Bay training ground, Coffs Harbour. "The Socceroos have certainly redeemed themselves." Well, the Socceroos have certainly redeemed themselves after a slow start at the Asian Football Championships. What a tough road for the guys. Asia has certainly proved to be a harder path for both the Socceroos and Matildas. It’s vital that we perform in every game, or one bad result will decide the rest of your campaign. If a loss or draw happens early enough sometime you can make a mend. In the World Cup finals it's much more crucial. We are competing in our World Cup in September this year. The Socceroos certainly proved that Australia are capable of competing on the World Stage and we proved ourselves at the Olympics back in 2004 finishing 5th overall. We have come a long way over the past few years as a footballing team and Australia has come a long way as a footballing nation. We need to prove ourselves this year in September just like the men did last year in Germany. Lets hope the Socceroos can step up and perform this Saturday night against Japan. I'm sure they will. The last time the two teams met was last year at the World Cup, I'm sure we all remember that game. The guys kept us on our seats right till the end. Lets all hope its going to be another exciting game. We have an international against New Zealand this Sunday, but I'm sure we will all be staying up cheering them on! SBS Reporter Massimiliano Civili talks Italian with Carl Valeri. I met up with Canberra's Carl Valeri in the mixed zone after the Thailand match. Carl was warming up ready to replace Vinnie Grella when Mark Viduka scored. "I almost got on, almost got on. But (Graham Arnold) changed his mind at the last minute," said Carl. "Thailand were one of the best teams in the Group. It's a pity they aren't going through. Technically they were very good." "Preparation has been good throughout the tournament but tonight we seemed to mentally be sharper. Maybe it was the atmosphere, the crowd were fantastic and seemed to lift us. It wasn't easy for The Socceroos. They were pinned back for most of the second half. "That's normal in football as they chase an equalizer, they'll push forward. It was a tactical game of soccer. And then they leave gaps and we can expose them, as we did. I'm just happy that we got through." "It gives me a bit of an extra chance to play in the Asia Cup which would be great." What about the mood in the camp. "Mood hasn't change, We've always been a tight group." "After the game the mood was relief. We can forget the last performances and look forward to Japan now. It would have been disappointing to go out now without showing what we can do." Is the squad getting fitter? "I don't know about me as I haven't be tested. But the team look sharper tonight." Are you looking forward to Hanoi and the Japan game? "Yes, it'll be a great game. Can't wait." But ever wondered who the best women players in Canberra are. Well, here they are. Captial Football women's squad to face USA side on Thursday. A Capital Football women’s invitational squad will be hosting foreign opposition on Thursday night when the Canberra girls take on the future of American women’s football - Cal United at the Belconnen Soccer Centre. The Capital Football invitational team will be made up of stand out performers from this year’s Club Pink Women’s Premier League players with the side to include former AIS keeper turned prolific goal scorer Luisa Marzotto (Weston Creek) and Belconnen United’s Nicole Somi a past Young Matilda herself with the team to be coached by ANU’s Kar Chaivannacoopt. Matilda's update: Four Canberrans in squad. The Matildas continue their preparations for the World Cup. The Matildas will continue their preparation for September’s FIFA Women’s World Cup with a six-day camp in Coffs Harbour this week highlighted by two practice matches against New Zealand. Coach Tom Sermanni will have an expanded squad of 28 players in the camp which commences today, with World Cup rivals New Zealand to meet the Matildas in the practice matches on Thursday and Sunday at the Novotel Pacific Bay training ground. Coach Sermanni is hoping to be in a position to have the 21-strong World Cup squad announced in mid-August following the Matildas final Olympic qualification match against Chinese Taipei on August 12. Australia will meet New Zealand in the practice matches on Thursday 19 July (3pm) and Sunday 22 July (1pm) at the Novotel Pacific Bay training ground, Coffs Harbour. Entry to the matches is free. The Matildas wrap up their Olympic qualification match schedule in Hong Kong on Sunday 4 August before their final group match against Chinese Taipei on Sunday 12 August at the BCU International Stadium in Coffs Harbour. Four uncapped players will feature in the squad, namely Ellen Beaumont (Brisbane), Louisa Bisbi (Melbourne), Amy Chapman (Canberra) and Lisa Hartley (Wollongong), with only experienced midfielder Alicia Ferguson unavailable for the camp. The 2007 FIFA Women’s World Cup will feature 16 nations and will be held in the cities of Chengdu, Hangzhou, Shanghai, Tianjin and Wuhan, September 10-30. Coach John Williams sent in this report on how Belnorth Lightning girls took out the Cup. The girls started the week without having trained together due to bad weather, so this was going to be a bit of a learning curve for all of us. The first four games showed plenty of promise with the girls not winning but holding their own. When it came to the quarter final against NSW Dolphins who we lost to 2-1 the previous day, I knew we could win with a few positional changes. The end result was a hard fought 1-0 victory. In the afternoon we played a semi final against Brindabella, the girls went out hard and should have been 2-0 up in the first 15 minutes but we could not find the back of the net. Brindabella scored a break away goal 20 minutes in and held out until half time. The second half was going the same as the first with Belnorth attacking but not able to find the equalizer, then Brindabella scored again against the run of play 2-0 down. With just over 20 minutes remaining we won a penalty, but the Brindabella goal keeper saved it. To the girls credit and never say die attitude they threw everything at Brindabella. We won a free kick 25 yards out and Jade fired it into the top left hand corner 2-1 game on. With 12 minutes left Liana scored the equalizer from 8 yards out and now the girls new they could win. Final minute Madeline (Mady) ran down the right hand side of the box with the ball and with some of the girls yelling shoot she fired home the winner. The final was against Braidwood who we had lost to 1-0 in our second game, so we new we could match them. The game started with Braidwood doing most of the attacking and the girls trying to hit them on the break. This was not working and the girls were under a lot of pressure. I made 4 positional changes and that seemed to work better as the girls where able to push out more. The first half was end to end with both teams having chances but at half time it was 0-0. In the second half both teams looked more determined and came out harder but neither could break the deadlock. With 23 three minutes remaining Liana made one of her mazy runs with the ball and as she had done in the semi final she scored from 12 yards out. We knew Braidwood had to attack even harder now and that we had a chance of hitting them on the break. The girls all rallied in defence as Braidwood came at us. With injuries to Jade, Dani and Elise (our keeper) the girls did a remarkable job to keep Braidwood out. As time was running out we had a few half chances to seal the victory but Braidwood did most of the attacking but in the end the girls won in what has to be one of the best turnarounds ever. Well done Dani and Stacey three straight plate wins, to Milly, Anne-Marie, Josephine, Shanly and Elise back to back wins. To the girls for the first time Liana, Ali, Chloe, jade, Rosa, Mady and Frances. Walnuts, Macca, Jozo, (All Tuggeranong United boys) Rod Lynes, Ian Price, Chris Conti, Kate Parker, Sean Blunt, Stephen Blunt, and Gordo with Koala. This story first appeared in the Canberra Times. Thanks to all the Canberrans for turning up. When Socceroo and Canberran Carl Valeri looked up into the stands at Rajamangala Stadium, Bangkok on Sunday night he saw the symbol of the Canberra junior club he once played for amongst the Green and Gold Army. Walnut, Macca, Jozo and Gordo, as the lads are known are all Tuggeranong United players following the Socceroos Asian Cup adventure in Bangkok. Gordo carries his cuddly good luck charm, Koala, with him to games. Kate Parker had seen her parents go to Germany last year. The group were in good spirits before the Iraq game. All were confident of victory. Sean Blunt had been watching the Oman game which ended in a 1-1 draw with a late equalizer from Tim Cahill. Australia plays Thailand in their last group game on Monday night 10:30AEST. If Australia win and Iraq draw or beat Oman, Australia and Thailand will both have four points. The team who won the game (in this scenario Australia) between these two sides will go through. Arnie: Do you need my help? Three and a half hours to go, I'm in the hot seat. Full scale security for the Australian game but with small frame I nipped in unnoticed. And there was Arnie's seat. And it is hot. Reckon Arnie could do with my help, so if you're reading this Arnie just three hours before the game it's not too late to ask. Play Mark Milligan at right back..and push Brett Emerton forward. Left back...maybe play Mark Milligan there as well. I know he's a right back, but Luke Wilkshire isn't a full back on anyside. Failing that just do it, for Australia, for yourself. It's all a bit tense but don't lose Australia not tonight. It's a bit cooler today at the moment but it could change. Bangkok is that sort of place. I can't bare it....but we're going to win. "I looked up and saw the banner. It was awesome." Canberra's Carl Valeri at the Socceroos Hotel in Bangkok. I caught up with Carl after the Oman game. "It was a tough game, but I'm absolutely convinced we'll get better." We discussed the game and during the discussion, Carl sparked. "Did you see the banner, the Tuggeranong United banner." "Yes, in the middle of the Aussie fans. I looked across to the fans during the game, and saw a sign on a banner. I thought I recognise that sign. And then I read the banner Tuggeranong United. It was awesome, so inspirational. Do you know who they are?" "No, I actually didn't see it." "Well tell them thanks from me if you find out." So well done the boys from Tuggeranong. Great to see the local support for the Australian team and hope you are having a ball. And of course Carl played for Tuggeranong United as a junior. ED; I'm planning to meet Canberrans in Bangkok at 4pm at the media gate at the stadium w1. Hoping to organise a photo and story for the Canberra Times. If you know anyone in Bangkok, let them know. The more the merrier.